Introducing the new Hopper 3. You can order DISH Network online and you will have a local installer you can trust. You also have local service. We say, "On Time, Done Right". That is what Rick has been doing for over 10 Years. In the Abilene, Sweetwater, Brownwood marketing area, DISH has the local channels. Many people want the local channels, so they ask for DISH Network. and Rick will install your satellite TV. On Time, Done Right. Now the cable conglomerates have to compete against the benefits of Digital Satellite TV. More than 27 million households have already switched to Satellite TV and now it's your turn. Why? When you compare Satellite TV to Cable, you will discover that the biggest reasons are cost, picture quality, program choices, and customer satisfaction. At the end of the day, the bottom line is... if you watch only a couple of shows... or if you live in an area Cable costs you less than $20 per month, then cable may be your best option. But, on the other hand, if you want the biggest variety of shows, movies, sports, and news for the least amount of money...especially with the digital transition here, if you want to enjoy all your favorite shows in crystal clear digital picture with CD quality digital sound... and you want the option of watching them in High Definition format and recording them on a DVR receiver, then Satellite TV is what you're looking for. Don't waste another moment, pick up your phone and call us at (325)725-1471 right now!!! Satellite TV offers you access to more of your favorite channels than cable. In fact, Satellite TV brings you exclusive channels as well as new exclusive programs that are not available to you on cable. There is more of everything you love to watch when you sign-up for Satellite TV. So, what are you waiting for? Call us at (325)725-1471 now! Sports Fans!!! If you love Baseball... Basketball... Football... Soccer... Professional or College Sports... Hockey... Golf... Tennis... NASCAR Racing... Boxing... Wrestling... Martial Arts... Satellite TV offers you feeds from both East and West coasts as well as alternate sports programming from channels like ESPN, Fox Sports and many other sports channels and exclusive premium sports packages that cable can't offer. Experience a really exciting world of sports action. Call us at (325)725-1471 right now!!! If you are a movie buff, think about the cost of a night out at the movie theater... gasoline, parking, tickets, popcorn, soda and candies... it really adds up fast! Starting under $20 per month, Satellite TV shows hundreds of hours silver screen blockbusters and classic films every week. Whether you like comedies, science fiction, documentaries, action films, or dramas... Satellite TV has all the movies you want to see. Plus, you can add any or all of the top Premium Multi-Channel Movie Packages from HBO, CineMax, SHOwtime and Starz!!! Don't wait a minute longer, give Rick a call at (325)725-1471 right now!!! HDTV gives you greater picture detail with higher resolutions, truer color, clearer reception, a theater-like wide screen picture and multi-channel Dolby Digital surround sound. HD DVDs are great but Satellite TV offers you the most Movies, Sports, Special Events, News and other Programs that are broadcast in true High Definition. One other thing to keep in mind... Cable will make you buy your HDTV Receiver and when you call us right now, you will a FREE Upgrade to HDTV... NO EQUIPMENT TO BUY!!! So, get your HDTV, and use it to its full potential. Call us right now at 725-1471. Some cable companies advertise digital programming, but upon further inspection you'll find they charge extra for this service and offer only a few digital channels. , Satellite TV gives you every single one of their channels in purely digital format. Get into the digital transition and call us at (325)725-1471 today!!! Do you prefer the sound of a CD over a cassette tape or a record? It is exactly this same quality difference when you switch to the 100% digital signal on Satellite TV. When you sign-up for Satellite TV, you will hear sound effects, music and dialog in movies you've seen before that you never realized you were missing. Bring the exhilaration of movie theater sound into your home, call us at (325)725-1471 now!!! The incredible detail of the sharp, crystal clear picture you will see when you sign-up for Satellite TV is a 100% digital quality signal. Satellite TV offers you better reception on every single channel than Cable. Why? The next time you pass by your local Cable office, look at all the Satellite dishes they use to get the signal that they pump out to you through their cable. When you subscribe to Satellite TV you will get the signal without any "line noise" or "ground distortion". ORDER NOW and ditch your cable!!! How many times has your local Cable Company raised your rates recently? , Satellite TV saves you a lot of money compared to Cable. Look at your Cable bill, how many Channels do you get for that rate? 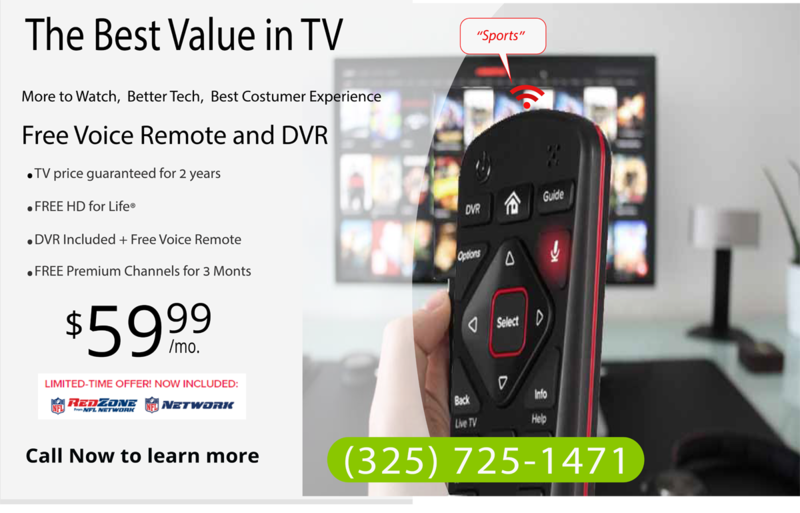 Call us right now at (325) 725-1471 and see for yourself that when you sign-up for Satellite TV, you will get more of your favorite channels in better quality for less money than cable. Cable TV tries to tell people that you have to buy your Satellite TV equipment but that is just not true. When you call us at 725-1471 right now and sign-up for Satellite TV, there is NO EQUIPMENT TO BUY!!! You will get all the equipment you need FREE, including a Satellite TV Dish, Receiver(s), Access Card(s), Remote Control(s) and required cabling with FREE Professional Installation. Of course if you need to set up a large quantity of rooms in your system, a large number of TV sets there will be a small fee. Please call us at 725-1471 now, we will give you all the details and help take care of all your special needs. Satellite TV lets you have 4 rooms installed for free. Call now and get your satellite installed. On time, done right. A digital video recorder (DVR) or personal video recorder (PVR) is a device that records video in a digital format to a disk drive or other memory medium within a device. That is exactly why you can stop, pause, rewind or record live TV... You can even skip the commercials with your DVR! When you call us at 725-1471 and sign-up for Satellite TV, you will get a FREE DVR Upgrade, so call us now!!! If you have an HDTV set, you also need an HD Receiver so you can actually see programs in High Definition. Cable does offer some limited HD programming but will make you purchase a High Definition Cable Box. When you sign-up for Satellite TV, you will get a FREE HDTV Upgrade, there is NO EQUIPMENT TO BUY, PLUS, Satellite TV offers you access to the largest variety of movies, sports, special events and shows from around the world. Don't wait another minute, call us at (325)725-1471 now and get a FREE Upgrade to HDTV!!! Professional satellite TV installation will save you hours of work, plus you can count on the job being done correctly. If you hire a local home theater company or other Satellite TV Dealer to do your installation, the fees can range from $150 to $250 or more! However, when you call us at (325)725-1471 and sign-up for Satellite TV now, your Professional Installation is FREE!!! We will help you plan the best system to suit your needs and schedule an installation time that's convenient for you. Depending on where you live, this may be anywhere from one to five days. In addition to installing and wiring your Satellite TV system, your Professional Installer will also show you how to operate your system and answer any questions you may have. So, call us now at (325)725-1471, friendly operators are standing by. Cable TV outages average 3% to 5% per year and J.D. Powers & Associates ranks Cable companies as good to poor in customer satisfaction while Satellite TV outages average about 1% and J.D. Power & Associates has ranked Satellite TV providers higher in customer satisfaction than any of the Cable companies for the last five years! So, do the right thing for yourself and your family... pick up your phone right now and call us at (325)725-1471. Satellite TV service is offered all over the U.S. including Hawaii and Alaska although professional installation is NOT FREE in either Alaska or Hawaii. In Alaska, you are so far North that a pole is required to raise the dish up high enough to allow the dish to "see" over the horizon line of the Earth. This way the dish will have a clear line of sight to get the signal from the satellite in the sky. In Hawaii it is similar but different because in Hawaii you are almost directly underneath the Satellite in the sky and a special attachment is required for the installation to allow the dish to have a clear line of sight. When you sign-up for Satellite TV, there is no need to worry about the digital transition. Digital Satellite TV made the transition very simple for you! If you already subscribe to Satellite TV, there is likely nothing you needed to do—We already took care of you. If you have not yet signed-up for Satellite TV, right now is the best time to get 100% digital TV to get more of your favorite channels for less money than cable! Call us right now at (325)725-1471. Satellite TV is the leader in providing international programming offering packages from around the world ( Africa, Armenia, Brazil, Caribbean, China, Europe, France, Germany, Greece, Israel, Italy, Japan, Korea, Middle East, Philippines, Poland, Portugal, Russia, Vietnam...) as well as Spanish Language channels and packages. Call us at (325)725-1471 and we will give you all the details. When you sign-up for Satellite TV, you can also subscribe to local channels in most metropolitan areas across the country. You also have the option of receiving local channels with an off air antenna that can be connected to your satellite receiver and accessed via your remote control. Give us a call at (325)725-1471 and we will give you all the details. Yes, you can paint the dish but not the LNB at the end of the arm on the dish. If you do decide to paint the dish, you must make sure to us a flat, matte finish paint only. Do not use a gloss, latex or metallic paint. Any color is fine. It is also recommended that you use as few coats as possible as more paint will increase signal loss. Having said that, painting the dish is not recommended because if you use the wrong type of paint or if you get any paint on the LNB at the end of the arm on the dish, it will cause signal loss and void your warranty. Before you can decide if you are going to paint your dish, you need to sign-up, so please call us at (325)725-1471. Rick knows all the do's and don'ts regarding satellite dishes. When our professional installer sets up your system they will explain how easy it is for you to block any channel(s) you may want to password restrict (adult channels, premium channels, pay-per-view or specific programs by its rating). Using the Parental Controls to block programming can actually hide the blocked channels from your Electronic Program Guide (EPG). This prevents any children in the household from viewing the programming or accessing the program information. Call us at (325)725-1471 and sign-up for Satellite TV now. Occasionally during heavy sustained rainfall, you may experience a brief period when the picture may freeze momentarily while the receiver re-locates a lost satellite signal. This may also happen if the dish becomes covered by a substantial amount of snow. This is easy to fix by gently brushing away heavy accumulation of snow from the dish arm. During your FREE Professional Installation, your signal strength will also be optimized to reduce the likelihood of signal loss during severe weather. As a preventative, you can also apply a product like "Rain X" to the dish itself which will make the rain slide right off, the same way it makes the rain roll off you car wind shield. If this is a major concern to you, ask the installer to set up the dish in a location where it will be easy for you to access. Aside from that, there are also several aftermarket products available (such as a "Hotshot" or a "Dish Cover") that will reduce the amount of snow or ice that will be able to build up. The next time you pass by your local Cable office, look at all the large Satellite dishes they use to get the signal that they pump out to you through their cable. When you subscribe to Satellite TV you will get the signal without any "line noise" or "ground distortion". Call us at (325)725-1471 and ditch your cable!!! Get your own DISH.